Born: 1822 in Rankin County, Miss. Education: Bethany College, Bethany, W.V. Buried: Fircrest Cemetery near Monmouth. The Scottish/Irish/English heritage of the Restoration Movement can be seen in the number of men named Campbell in the movement. There was Thomas Campbell and his son Alexander, founder of Bethany College in Bethany, WV. They did not come west. Our man in focus, Thomas Franklin Campbell was a product of the deep south. Although born in Mississippi, he grew to manhood on a Louisiana plantation. He remained at home with his father until he was about 25. Always a teacher, he taught in schools of the area even before leaving home. He saw military action in the Mexican War. Directly following this service, he entered Alexander Campbell's Bethany College in West Virginia where he studied the classics. That was 1848 when the school was seven years old. T. F. Campbell may have been distantly related to Alexander Campbell, but his Irish-born wife Jane was a first cousin. Her father was Archibald, brother of Thomas Campbell, Alexander's father. This line of the Campbell family traces back to the Argyll Campbells and the famous castle of Inverary. Following their marriage, T. F. and Jane lived at Alexander Campbell's "mansion." Bethany had 151 students in 1852, T. F.'s year of graduation. It was fully coeducational and Jane had been a student there. Coeducational schools were not the norm in that era. Its President is one of our best graduates of Bethany College, a brother of indomitable energy, who was recommended by us for that place, and whose talents, industry, and devotion to his duties, have equaled, as we learn, our highest anticipations of his capacity for such a position. Those words are especially meaningful when they describe a former member of the household and former student in the classroom. In 1857 he was recalled to Bethany to receive an honorary degree. Mr. Campbell also practiced law and we find him doing that about 1858-1859 at Leavenworth, Kansas. By 1860, T. F. and Jane were in Platte County, Missouri. He was preaching in the church that he established in New Market and was Principal of Camden Academy. The church began with 75 charter members. Their third son, Prince Lucian Campbell, was born there in 1861. T. F. went to Montana by himself in 1863 and later brought his family. They lived at Helena, Montana where T. F. preached for the Christian Church, practiced law, and maintained a boys' home. He was appointed Territorial Superintendent of Schools by the Montana Governor. According to the Montana Historical Society, he performed the first baptism in Montana. His ministry also included preaching in mining camps. It is said he built in Helena the first house with logs hewed on both sides; that the Cammpbells had in the log house the first carpet (a rag one) used in that city. He started one of the three earliest Sunday Schools, and church historians credit him with having baptized the first convert made in the territory. -- Joseph Schafer in Prince Lucien Campbell, page 30ff. When he was chosen to head the Monmouth school in 1869, he solved the problem of moving his family to Oregon by purchasing a Holladay Concord Coach and selling it after reaching Oregon. They came via the recently-opened Mullan Road to Walla Walla and on to Monmouth. That was a trip of 1,000 miles. Link for more details about the Concord Coach. The Mullan Road connected Fort Benton, MT (near Great Falls) with Walla Walla, WA at a construction cost of $230,000. Captain John Mullan was the driving force. Much of its route is mirrored by I-90. The road was used about 10 years and was made obsolete by the transcontinental railroad. A story persists about Campbell's arrival in Monmouth. The school was just one small building. He asked where the school was located. He was told, "You are to build it." When he inquired about the funding for the school, he was told, "You are to raise it." And he did both. Campbell was a man of faith and courage. And just then he was starting out to build a real college in a village of two hundred and twenty two persons located among the primitive farms of Polk County. -- Joseph Schafer in Prince Lucien Campbell, page 33-34. Campbell's name is associated with preaching in a number of Oregon communities. He is listed in the history written by the Sheridan Church. He was involved in the earliest days at the Halfway Church, near the Idaho border. Mr. Campbell taught classes, lectured, wrote editorials, preached, and administered throughout the college year. Then, as a substitute for the customary vacation, he traversed the contributary country far and near delivering lectures, preaching, founding congregations of the Christian faith, raising money for the college, and recruiting its student constituency. -- Joseph Schafer in Prince Lucien Campbell. A token of Mr. Campbell's work can be seen on a plaque in front of Campbell Hall. It is the graduating class of 1873 and includes George H. Burnett, his son Albert Prince Campbell and Glenn O. Holman. Prince Campbell went on to be President of the Monmouth school and then President of the University of Oregon. T. F. Campbell was very effective as a traveling representative of the school. He was successful at fund raising and also edited a Christian periodical while functioning as school president, in addition to his duties of preaching in the Monmouth Church. Mr. Campbell hired Eliza Jane's brother, James Carr Campbell, as professor of Mathematics and Astromony at Christian College. J. C. Campbell was a nephew of Alexander Campbell of Bethany, West Virginia. He also served as associate editor of the Christian Messenger, published on the campus at Monmouth. T. F. Campbell made one foray in politics and was an unsuccessful candidate for State Governor in 1874. He did receive a substantial vote. "Every candidate for admission into the College must present evidence of good moral character. It is required that every student be diligent in study and punctual in attendance; that he neither introduce upon the premises nor use any intoxicating beverages; that he abstain from profanity, gaming, card playing; that he do not visit a drinking saloon, attend any ball, billiard saloon or other improper places of amusement; that he shall neither keep in his possession or use firearms, a dirk, a Bowie knife or any other kind of deadly weapon; that he do not loiter on the street." Campbell was not only an educator and a preacher, but he wielded a powerful pen. He installed a steam operated printing press in a small wooden building at the back of the campus and began publication of the Christian Messenger, a church and family paper designed to bring Christian College closer to its supporters and to aid in the growth of the church and its influence. However, the paper did much more; it enabled capable young men and women to learn newspaper work. To see an early copy of the Christian Messenger, check the footnote below. Because of confusion with another publication with the same name, it was soon changed to Pacific Christian Messenger. Campbell's son, Prince Lucian Campbell, graduated from the college at Monmouth and stayed on as an assistant to his father for three years. In 1882, the year of his father's resignation, he went to Harvard University. When he returned, he became the school's fourth president in 1889. Then he was selected to become the fourth president of the University of Oregon at Eugene. She was a Christian wife . . .
Jane Campbell was in poor health much of her life and frequently sick. She died in 1881 and T. F. resigned his presidency of the school. He was badly shaken and traveled to the east, speaking and staying away from Monmouth for three years. 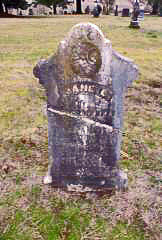 We have reproduced her grave marker at the right, but the bottom lines have faded with age. We could not make them out. Her father was Dr. Archibald Campbell and her mother was Ellen Carr Campbell. When T. F. Campbell returned to Oregon after three years, he married Miss Mary Stump, a student in his first class at Monmouth and the office manager from the Christian Messenger years. Her family were members of the Monmouth Christian Church. At the time of marriage, Mr. Campbell was 63 and Mary was 34. Their wedding was April 9, 1885. Following this, they settled at Eugene, where T. F. preached for part of a year. They had three children. Link to biography of Mary Stump Campbell's mother. Plans may have changed after the hand-shake, because the University at Corvallis does not have record of Mr. Campbell being on the faculty. 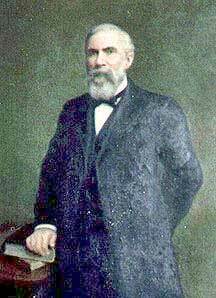 Mr. Campbell was president of Christian University (now Culver-Stockton College) in Canton, Missouri during 1888-1889. Following this, he returned to Monmouth. He stayed active in the preaching ministry. The Christian Standard reported in 1888 that he was aiding at Monmouth in a gospel meeting conducted by R. M. Messick. Thomas Franklin Campbell is buried at Fir Crest Cemetery, south of Monmouth. Jane Eliza is buried next to T. F. His second wife, Mary Stump, is buried a few plots to the north in the Stump family plot. View the heading of the Christian Messenger. Copies of the Christian Messenger can still be viewed on microfilm at the University at Monmouth Library or they can be requisitioned by your local library for use at the library. 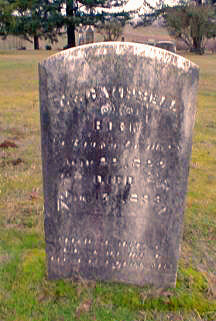 Ask for Christian Messenger, December 8, 1870 to May 17, 1877. For more on the life of Thomas Franklin Campbell, see Jerry Rushford's Christians on the Oregon Trail. Chapter 20 is entitled "Thomas Franklin Campbell of Monmouth."